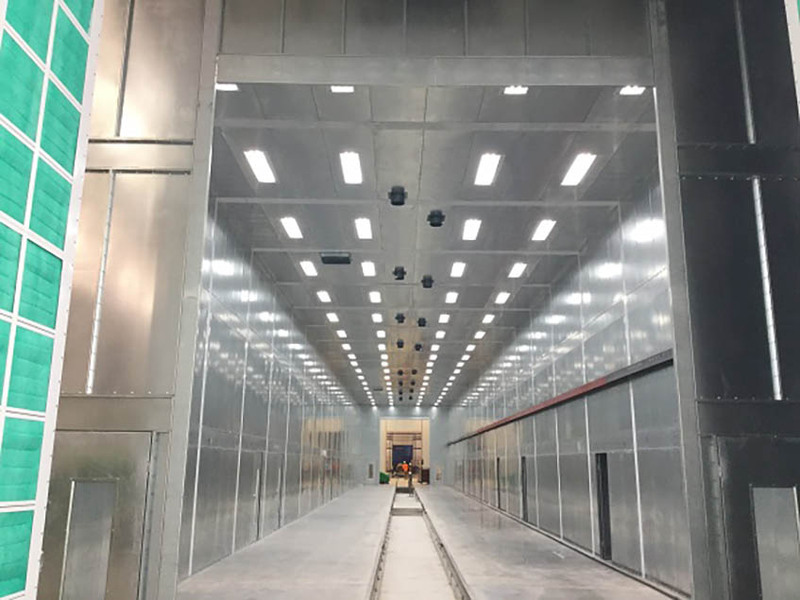 Keeping your paint booth properly maintained will streamline your work flow, but it involves many smaller aspects that often go overlooked. One culprit of maintenance interruptions is your paint booth light fixtures. Besides upkeeping the mechanical aspects of a booth, your paint booth light system is a very critical part. Without proper lighting, you can suffer the financial cost of re-work. A fluorescent light bulb loses color and lumens on a daily basis unlike an incandescent bulb that will burn as bright as the first day it was turned on. If you only replace one burned-out light at a time in the fixture, the color and lumens will not match as the lights fade over time even if the bulbs are all the same brand and part number. Always purchase enough lights to replace all fluorescent bulbs, even if only one is burned out. It is imperative to change all the bulbs at the same time and keep track of when you change them. If you replace all of the lamps in a fixture at the same time and all of the bulbs in your paint booth annually, you will avoid inconsistent finishing results. You can’t send your painters into a cave and expect them to produce a perfect paint job, can you? A decent bulb costs less than $200 for a case of 30. Look at light maintenance as cheap quality control for your productivity. Keeping the color and lumens of the bulbs in your light fixtures consistently bright is inexpensive booth maintenance. We can retro out your old T-12 fixture to a new T-8, or upgrade you to the latest in booth technology: LED lights. LED paint booth lights will be a one-time upgrade since these bulbs will last approximately 50,000 hours. The lifetime of LED lights takes the guesswork out of the equation when you consider how long your fixture will remain consistently bright. Less maintenance means no more boxes of old dusty bulbs laying around your facility, and most importantly, LED lights will burn brightly and the same color until they die. Now just keep your booth clean and focus on painting. Lens covers make all the difference for maintenance: keeping your light lenses wrapped in clear plastic film will lessen the amount of time spent cleaning overspray off the glass and scratching the tempered glass light cover. Keep your fixture cleaner longer. 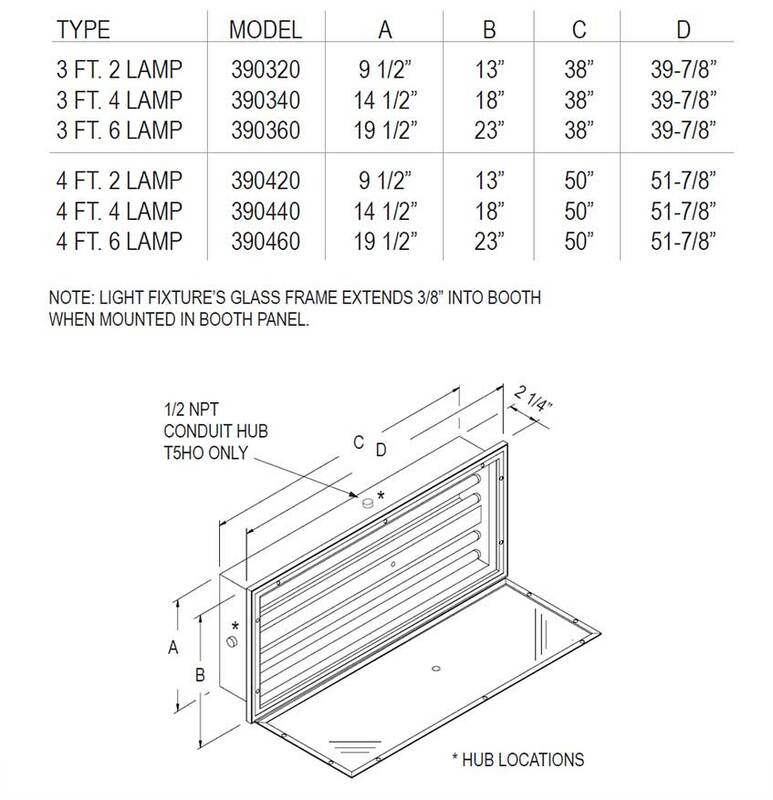 The most common light is a 4’ 4-Lamp Inside Access Paint Booth Light Fixture (Part # 390440-3546). It is available in 32 watt T8. This light is also available in 4- and 6-Lamp configurations. This light is available in a LED series. Keep in mind LED fixtures cost less to operate and lasts about 5,000 hours. If you aren’t just buying replacement bulbs for fixtures you already have, LED lights are an excellent option to consider that have low maintenance and high performance in your shop. If you are not sure what specifications that you need for your booth such as CRI level, lumens and Kelvin rating, consult your paint jobber or booth manufacture. You can always call us, and we can help light your way to a well-lit booth. Call 800-637-4027 and speak to a specialist today. We are here to help! Coming soon: the top pointers in the permit process written by our resident permit expert. 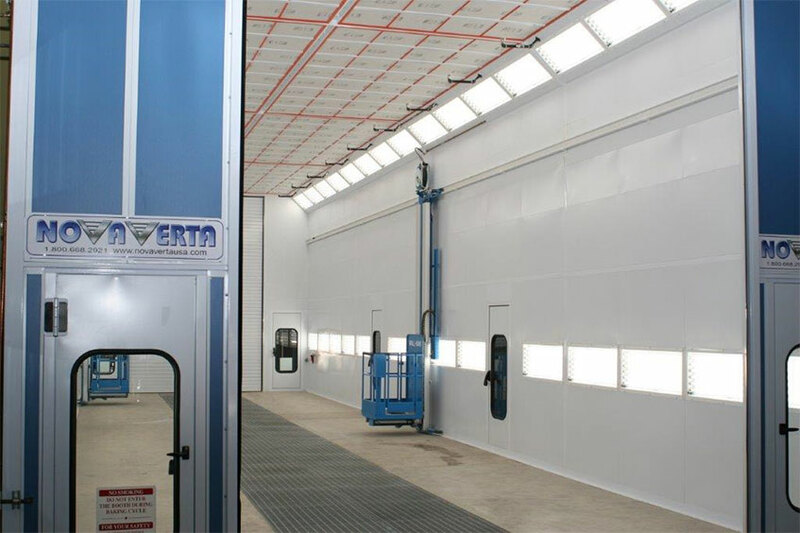 What Makes A Better Paint Booth?